For those who like to mask off the edges of woodwork or other surfaces in order to ensure sharp lines while painting, painter's tape is a great resource. It is very often misused, though, since many people choose to remove the tape immediately after painting, while the paint is still wet. In reality, the better practice is to wait until the paint is fully dry before peeling off the tape. A surprising number of people stubbornly adhere to the practice of pulling off the tape while the paint job is still wet—a tradition that may date back to problems with the original types of masking tape. Masking tape itself was originally created in 1925 by an engineer of the 3M corporation to assist workers in the automotive industry who needed a product to mask off edges while painting metal parts. The masking tape product was essentially a tough grade of paper layered with a pressure-sensitive adhesive on one side, and it worked very well on metals. The product quickly became a popular household item, too, and as people began using it to mask woodwork and wall surfaces, they found that adhesives that worked well on metal could be a little too aggressive on woodwork and wall surfaces. Standard masking tape worked fine at shielding surfaces while painting, but removing the tape sometimes could also peel away dried paint with it. Tape manufacturers gradually refined the adhesives used. The original types of masking tape still exist, but the products now marketed as specifically as painter's tape are a special form of masking tape that make use of adhesives that are virtually guaranteed not to peel away dried paint when they are removed. Product instructions are unanimous in suggesting that your paint job should dry completely before removing the painter's tape. Make sure the surface is clean, dry and dust-free so that the tape sticks properly. Apply tape onto the surface while pressing down as you go. Secure the tape by pressing down on it firmly with a smooth edge. Let the tape set for about 30 to 60 minutes before painting. Removal when wet creates a mess. 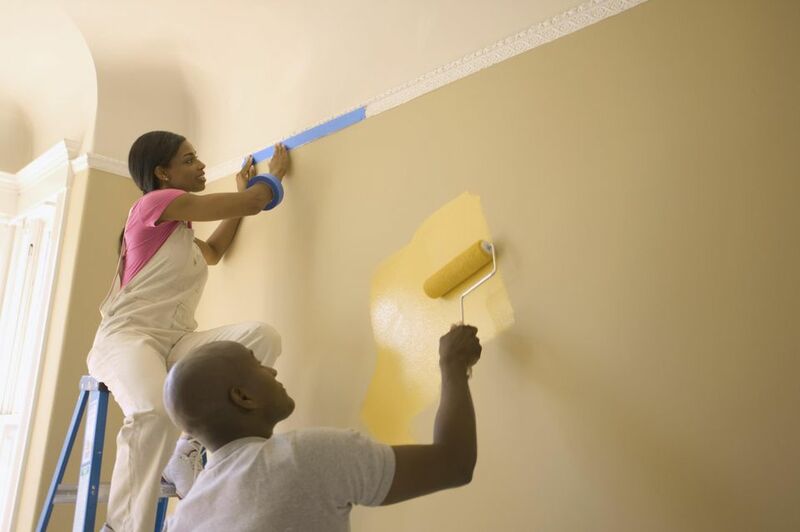 When pulling down painter's tape, you are dealing with multiple yards of paint-laden tape, which inevitably will touch your nice, clean walls or floors. Removing a mass of tape laden with wet paint without creating a mess is very difficult. Seepage. The instant you remove the tape, wet paint may seep into your formerly taped-off area. By keeping the tape in place until the paint has dried, seepage is limited. Rather than facing these problems, wait until the paint fully dries before removing the painter's tape. Each painter's tape has a recommended period during which the tape can be effectively removed. Many products will be specified as "14-day" removal. The tape can be removed at any point during this time without leaving behind sticky residue. If left in place longer than this, you run the risk of adhesive residues being left behind on the woodwork or walls. When removing the painter's tape, the proper procedure is to begin and one end and pull the strip of paint back on itself in a steady, slow motion at a 45-degree angle to the painted surface. The sharp edge of the tape cuts through the dried paint overlap, leaving you with a crisp, sharp painted edge. In the rare case that the tape tears or fails to pull away, a sharp utility knife or X-Acto blade can be used to slice the paint and remove the tape.